Nickname "The Golden Boy", "The Great One", "The Maestro"
Achievements Stephen has won 36 ranking (record) and 79 titles in all (from 115 finals). He has won a record seven World championships, six Masters and five UK championships. After surpassing Steve Davis in 1990 he was the No. 1 player in the rankings until 1998. In 2006 he regained the top spot. He became the youngest World Professional Champion, at 21 yr 106 days on 29 Apr 1990. Hendry became the first player to make more than two tournament 147s. His first was made in the 1992 Matchroom League and his second in the 1995 World Championship. The record-breaking third maximum came on 25 Nov 1995 in the UK Championship. Not content with this he made his fourth maximum on 5 Jan 1997 in the 1997 Liverpool Victoria Charity Challenge, his fifth on 23 May 1998 in the 1998 Dr Martens Premier League, his sixth on 19 Sep 1999 in the final of the 1999 British Open (the first maximum in a ranking final), his seventh on (21-23) November in 1999 in the 1999 Liverpool Victoria UK Championship, his eighth on 25 Feb 2001 in the final of the 2001 Rothmans Grand Prix, his ninth on 28 Apr 2009 in the quarterfinals of the 2009 Betfred.com World Championship, his 10th in the second round of the 2011 Wyldecrest Park Homes Welsh Open and his 11th in the first round of the 2012 Betfred.com World Championship! With the 11 maximums he is second on the all-time list. Ronnie O'Sullivan leads with 13. Stephen made seven centuries in the final of the 1994 UK Championship, which is a record in a professional match. He also became the first player ever to make five centuries in seven frames. From 17 Mar 1990 to his defeat by Jimmy White on 13 Jan 1991, the Scot won five sucessive titles and 36 consecutive matches in ranking tournaments. That's the longest unbeaten run ever. 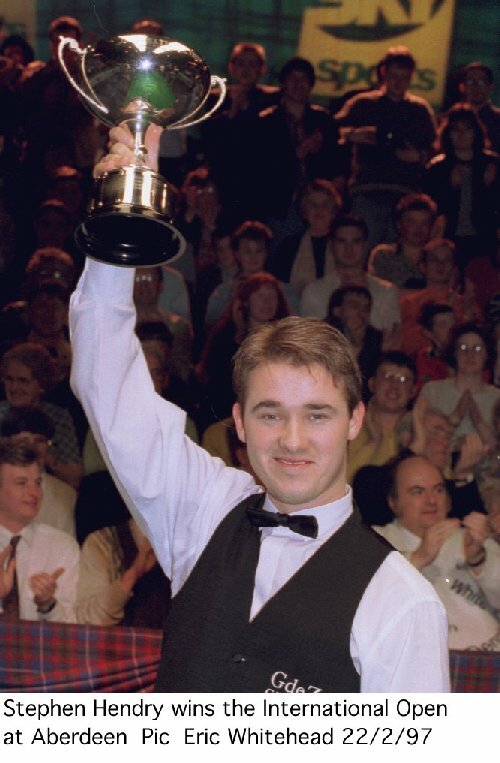 Hendry is one of only five players to win both the World Championship and the UK Championship in the same year. Steve Davis, John Parrott, John Higgins and Ronnie O'Sullivan are the others. Together with Steve Davis and John Higgins he is also the only one to hold the World, UK and Masters titles at the same time. Hendry holds the record for most tons by one player in a tournament. He made 16 centuries during the 2002 World Championship. He was voted WPBSA Young Player of the Year in 1988 and Player of the Year in 1990, 1991, 1992, 1993, 1995 and 1996. He was a member of Scottish teams that won the 1996 Castrol-Honda World Cup and the 2001 Coalite Nations Cup. Miscellaneous He has defeated Jimmy White in four World Championship finals (1990, 1992-94). His career record against the "Whirlwind" is 27-13 (?). Hendry had won their last 14 encounters before he was dumped 10-4 in the first round of the 1998 World Championship. In the 1998 UK Championship he suffered a career-worst 9-0 loss to Marcus Campbell in the first round. Stephen had won all his 12 matches with Tony Drago before he was beaten thrice in a row, in the quarter-finals of the 1998 German Masters, the quarter-finals of the 1998 Irish Open and the second round of the 1999 Benson & Hedges Masters. See Hendry's profile in the Score Centre for results from 2010/2011 and onwards.